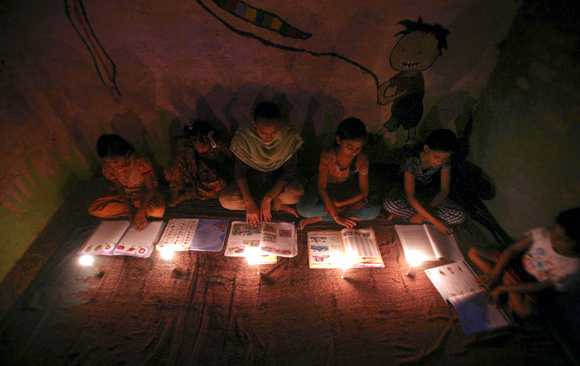 Goa, Uttarakhand and Meghalaya will initiate schemes to enable 24x7 power to consumers. The National Democratic Alliance (NDA) government has started the process of setting the power sector right, with Goa, Uttarakhand and Meghalaya taking the lead in joining hands with the Centre. Besides regular rate increases and debt restructuring to clean up their books, these states will also initiate schemes to enable 24x7 power supply to consumers, at a cost of Rs 7,563 crore (Rs 75.63 billion). Unlike the United Progressive Alliance government’s financial restructuring plan for distribution companies, the NDA government’s programme will have no grant from the Centre to incentivise reduction in debt and losses. The Centre is pursuing states to tackle these issues by increasing rates and raising funds from the market. Budgetary support from the Centre would be solely for its flagship schemes — the Deendayal Upadhyaya Gram Jyoti Yojana and the Integrated Power Development Scheme. Till FY19, the overall requirement of funds for Uttarakhand will be Rs 4,854 crore, Meghalaya Rs 2,553 crore (Rs 25.53 billion) and Goa Rs 1,576 crore (Rs 15.76 billion). Any shortage will be met through external/market borrowings from financial institutions or developmental aid agencies, which the state concerned will facilitate. The door to central funds, however, won’t be completely shut. “The state can ask for financial support but only when its generation, transmission and distribution utilities abide by the respective state electricity regulatory commission,” said a statement following the signing of agreement with the three states. Earlier, CRISIL had prepared a report on state utilities and suggested measures to reform the system. It had proposed rate increases of 1.7 per cent for Uttarakhand, 11 per cent for Goa and 15 per cent for Meghalaya from the next financial year. These states are reeling under huge losses and mounting debt, owing to no increase in power rates for years. The accumulated financial losses of Uttarakhand’s power distribution arm stand at Rs 1,695 crore (Rs 16.95 billion), while the Meghalaya Power Development Corporation’s losses are Rs 694 crore (Rs 6.94 billion) and the Electricity Department of Goa’s Rs 624 crore (Rs 6.24 billion). According to a joint statement released on Monday pointed to a five-point agenda for these states - an increase in power generation from local energy sources (for instance, hydro in Uttarakhand and Meghalaya), an improvement in the inter-state transmission network, a revival of the sick distribution sector, enhancement of the use of renewable energy and the use of energy-efficient measures. Among the other initiatives suggested was a strong communication, information technology and monitoring division. The Centre will provide assistance in terms of central financial assistance from the Ministry of New and Renewable Energy for various schemes and the power ministry’s support under various schemes for rural and urban electrification. “This joint initiative of the government of India and the governments of Uttarakhand (as also Goa and Meghalaya) aims to further enhance the satisfaction levels of consumers and improve the quality of life of the people through 24x7 power supply. This will lead to rapid economic development of the state in the primary, secondary and tertiary sectors, resulting in inclusive development,” Piyush Goyal, minister of power, coal and new & renewable energy, said in one of the three joint statements. 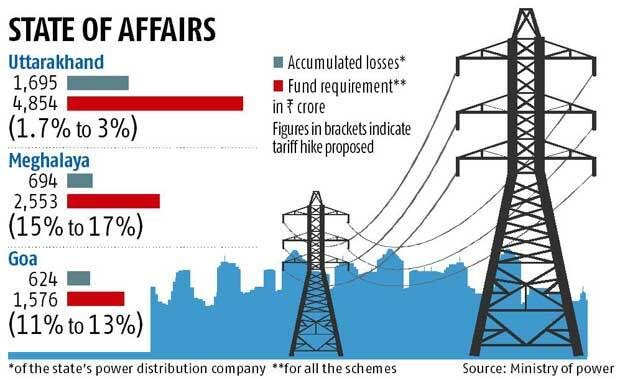 Last week, Business Standard had reported the Centre had come up with a slew of measures to push sick state power distribution companies towards financial and technical restructuring. CRISIL will also prepare consultancy notes for Uttar Pradesh, Chhattisgarh, Madhya Pradesh, Karnataka, Tripura and Puducherry. While Deloitte has been appointed the consultant for Jharkhand, Assam, Maharashtra, West Bengal, Tamil Nadu, etc, Mecon will cater to the likes of Bihar, Telangana, Gujarat, Punjab and Delhi. A joint initiative document for these states will be released by the end of this year.